Austin takes its technology seriously and there is plenty of action to go around. Actually, nothing is small about this Texas town where 110,000 people, one-tenth of the metro population, are employed by 925 high-tech companies. Spurred in the late 50s by a city economic development effort and scientist Jack Kilby's invention of the integrated circuit at Texas Instruments, Austin has more patents per capita than any other city in the country. What started as Dell, IBM, and Motorola has spawned dozens of fourth- and fifth-generation start-ups. No wonder it's called the "City of Ideas"
Austin was founded in 1839. 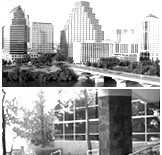 Austin is the 27th largest city in the United States. Austin is within 200 miles of San Antonio, Houston, and Dallas. Austin has 11,800 acres of land used for recreation. Austin is the 4th most visited city in Texas. Average rainfall - 32 in. As you know (or may not) Texas has no state income tax and cost of living is fairly low in most areas! Go visit the Salary Calculator to compare the cost of living in Austin to where you live now.